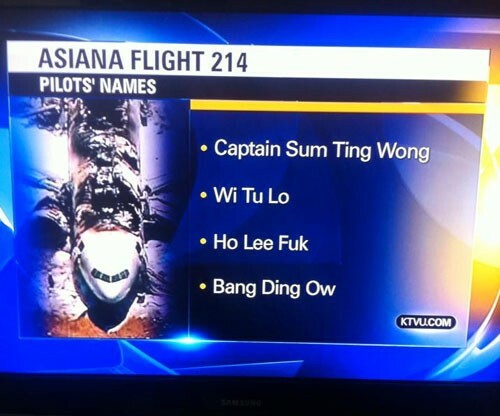 media KTVU Reports Asiana Pilots Named "Sum Ting Wong," "Ho Lee Fuk"
Today, KTVU News announced the names of the pilots on Asiana Flight 214, provided to them, apparently, by a 12 year-old boy, and vetted by nobody. Yeah—we didn't think "Sum Ting Wong," "Wi Tu Lo," "Ho Lee Fuk" and "Bang Ding Ow" were real names either. For your cringeworthy moment of the day, here's video footage of KTVU's reporter reading the names out loud on live television. It didn't take too long for KTVU to issue a correction and apologize.